Candy is a new element to the main series Pokémon games, adapted and carried over from Pokémon GO, but with a twist. In Pokémon: Let's Go, Pikachu! & Let's Go, Eevee! the Candy just provide a boost to the stats. Each Candy will give certain Awakening Values to a Pokémon which equate to stat points. There are multiple different kind of Candy, each focusing on a Pokémon's specific stat and giving various boosts. As you reach the higher values, your Pokémon will start to require more Candy. 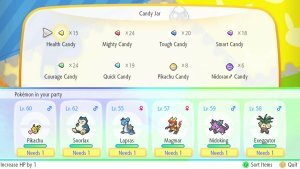 There is a cap of each candy before you get to the final candy, and this is done so even though you may need 17 of standard Candy to go up to the next AV, you will only need 1 of the Candy L. This works in a way so you don't completely overpower your Pokémon early on. However, species specific Candy has no restrictions so you can use 200 of a species candy to max out a Pokémon's AVs regardless of the Pokémon's level from the outset.